Mom, Here's a couple more for your Mini-Van Collection, I snapped these in Vanuatu for you.....hope you like 'em . Welcome Home Gibbo!!! Hope you had a wonderful time!! Thanks for the Minivan pictures... it's always fun to see more of the Ugly Fleet. Somebody oughta tell those guys about matching paint... nose baggage- and pilot's- doors must have been slapped on in a hurry.. hee heee! Can't wait to hear about your cool vacation, mate!!!!! We have missed you. Errr s'mom i cant remember ever taken you hiking so where did you get that photo of me for your avatar? Me about to set off on an abortive flight which ended with me and a friend spending two days stranded right back at the same airfield after the weather turned nasty last week. such is the life of an aviator.. I remember getting stranded many times. I STILL LOVE your avatar Leia !! Is that your own plane in the background? Ye-es, I suppose it was a triumph of optimism over common sense to even get airborne. One of the guys who went down with us has an IMC rating and got home okay, but we were both VFR flyers in TOMSsyplane and only got a few miles before turning back. Consensus was we'd rather get home late than never -- the accident report from an earlier VFR into IMC fatal crash had just been released and was sitting on the desk in the tower when we wandered up to explain we were stuck -- so by that time we were quite certain it was the right choice! 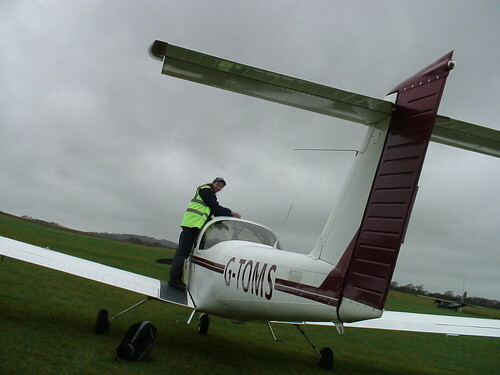 Na, one of the school 'planes, though you can't really see the paint scheme, so I suppose I could pretend it was TOMS. I just used one of those dollmaker tye programs to make the "mini-me" to paste on top of the pic. This is from their weather site -- courtesy of the Mount Washington Observatory. Have some NICE rime icing!! Elevation: 6288'MSL. Here's my Latest. 1/32 Scale Hellcat. that is sure pretty is that open gun covers i spy? Yuppers open gun covers. I didn't do too much different with this model. I made some seat belts for it, as none came with it. I also cut off the ailerons and elevators, and rudder, then reattached them to give more of a realistic look. The final different thing was to hollow out the rudder leaving only a frame. I covered it with tissue paper to give it a fabric look. Can't see it in the picture, but it turned out alright. I hung around in the rain, waiting for the Wiener Man to come back, so I could find out how you get a JOB driving this BEAUTIFUL puppy!! Alas, he never did show.... but, here's the beauty.